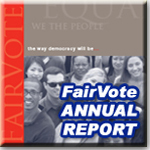 Operating for many years as the Center for Voting and Democracy, FairVote was founded in 1992. It has a large volunteer network across the nation, with closely allied groups in states like California, Minnesota, North Carolina and Rhode Island. FairVote is a proud member of the Leadership Conference on Civil Rights and the National Council of Women's Organizations.